Up to 15,000 new homes may be built in the Selby area with the creation of a new "eco-town", it has emerged. 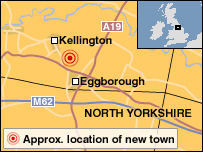 The town, provisionally called Willow Green, may be built between Eggborough and Kellington. It is on a list of possible sites to be announced soon. An eco-town supplies new houses without damaging the environment, using sustainable building methods. Local Labour MP John Grogan said the development could lead to better infrastructure for the community. The government will announce a list of possible "eco-town" sites next month before a special planning process can begin. Last May, the prime minister promised communities of up to 100,000 low-carbon and carbon-neutral homes would be built around the country, as part of a drive to increase house-building.